The advent of OTT has made TV advertising more accessible to mobile-first marketers who previously could not have afforded to fit TV into their performance advertising plan. Beyond the clear synergies between OTT and mobile for app advertising across screens, addressable buying methods have lowered minimum spend requirements while offering more sophisticated targeting than traditional TV. 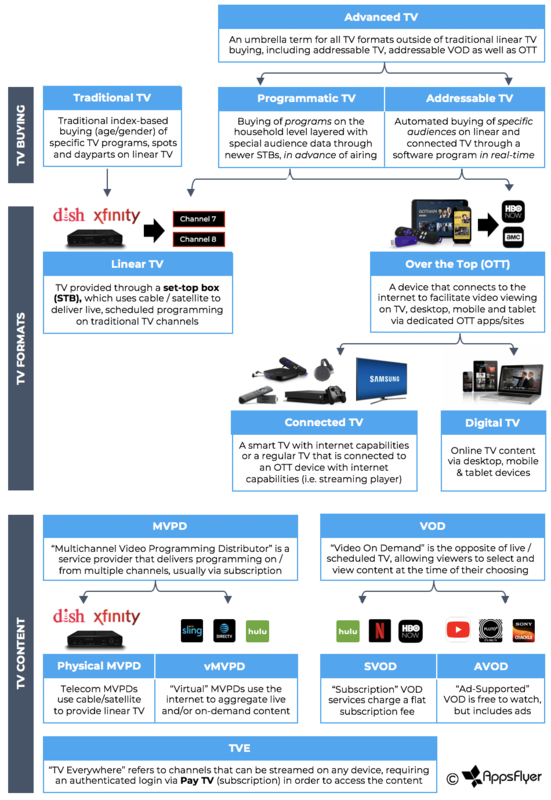 Introduction: This first post will provide an introduction to OTT television with key trends that illustrate the value of the OTT audience, viewing behaviors, as well as how OTT is growing by usage, spend and market share. Measurement: We’ll not only cover the technical details of how OTT measurement works with AppsFlyer, but we’ll also explain other industry solutions that will help you plan out your cross-device measurement strategy. Amazon Fire TV: Coming out of beta testing with Fire TV in Q4, we’ll shed more light on how the integration works as well as Fire TV media options. Media Buying: Jumpstart your OTT test strategy with expert advice on media sources by category, targeting options, performance expectations and more. *Android TV includes Nvidia, Philips, Sharp, TCL, Toshiba and Skyworth TV brands. This list is just the beginning, as we’ll continue to develop new and more advanced measurement integrations in the coming months. Check out our next post for more details. Advanced TV terminology can be complicated and often inconsistent depending who you ask,3 so let’s take a moment to clarify a few definitions. To begin with, advanced TV is an umbrella term for non-traditional TV buying. Within advanced TV, the most common method for buying OTT ads is addressable TV – although confusingly, you’ll often find DSPs and digital trade desks refer to this as programmatic buying in line with the digital definition of programmatic. Regardless of who you buy from, asking about their methodology is key to understanding what you’ll get out of it. Lastly when considering your OTT/CTV buying strategy, there are important distinctions to consider in terms of how TV formats are labeled as well as the type of content delivered for targeting purposes. Overall, OTT viewers are a highly engaged audience – especially on TV, the preferred screen for 75% of OTT streamers.6 Consequently, OTT app owners often find that those who watch on CTV are stickier than those who watch only on mobile. CTV viewers are also more engaged with ads than their desktop/mobile counterparts (2x longer ad engagement time + 25% higher completion rate). This trend is magnified on OTT over linear TV, as OTT viewers are more likely to say their second-screen activity is completely or mostly related to the program or ads.7 This may have something to do with the ad format of OTT apps, which are non-skippable (no DVR) and tend to have fewer commercials with less ad time than linear TV. These trends are important to consider for OTT advertising, as marketers will want to focus their attention on the highest reaching players. We’ll dive deeper into how to navigate this from a measurement and buying perspective on our next few posts. 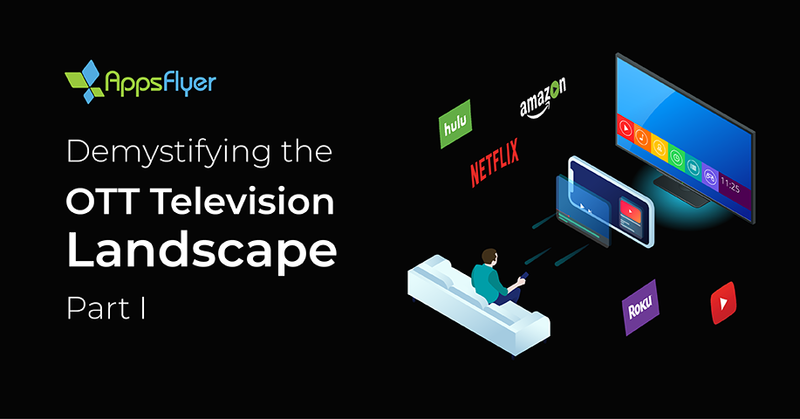 In the meantime, check out our TV Attribution page or schedule a free consultation with one of our measurement experts to gain more insight on AppsFlyer’s OTT and mobile attribution solutions.